The 2.5 release of the NT8 adds liquid classes for well solution aspiration and dispensing, resulting in more accurate dispenses; as well as Flexible Finger clamps to lock dispense tips in optimal dispense or aspiration position. Liquid Classes for Well Solutions. The NT8 has been programmed to handle well solutions based on liquid class, resulting in more accurate aspirations and dispenses. Options include Normal, Medium, High, and Very High. 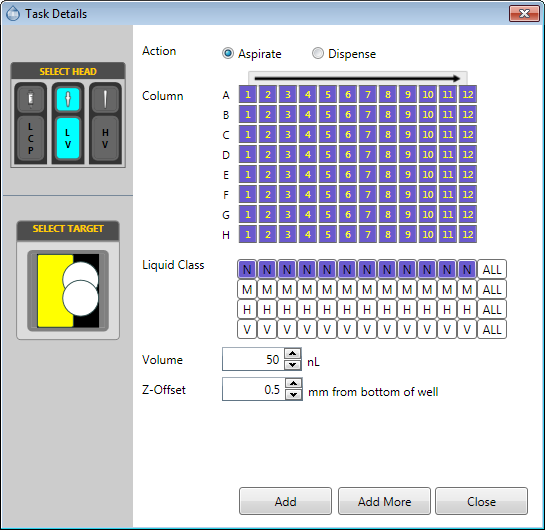 The liquid class is set when you add an aspirate or dispense command to the task list. Flexible Finger Clamps. Before the NT8 begins dispensing reagents, new flexible finger clamps will automatically lock the tips in position once they touch the base of the well and then retract by a specific distance in order to create an equal gap between the base of the wells and the tips. This creates smoother dispenses by creating more accurate and precise dispenses at the drop location and reducing air bubbles in the drop. Create Three Daughter Plates from One Deep Well Block. The NT8 now allows you to create daughter plates on microplate station 3, allowing you to create up to three daughter plates from one deep well block in one task list. More Flexible Control Over Humidifier Operations. You can now switch the humidifier from Manual to Automatic control or vice versa when the NT8 is executing a task list. Simply click the humidifier button on the toolbar to change modes.